April is the peak of the Spring migratory bird season along the Texas Gulf Coast. High Island is the center of the target for birds that have flown non-stop from the Yucatan Peninsula or Northern South America. From time to time, we like to go over during this season to see how the professional birders do it. During this period, professional guides from Tropicalbirding.com give free bird walks each day and they are simply amazing to witness. 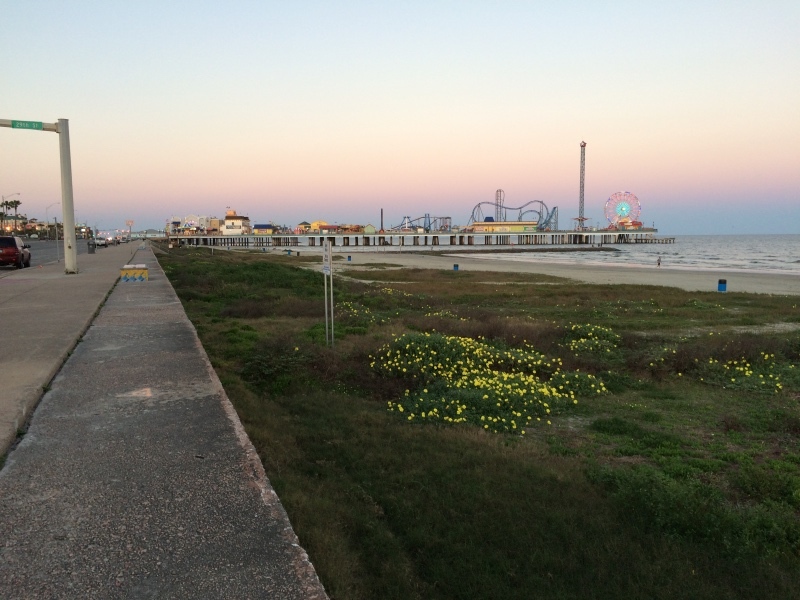 We started out by spending one night in Galveston at our favorite camping park off 61st Street, then took the Bolivar Ferry to the Bolivar Peninsula and on to High Island. 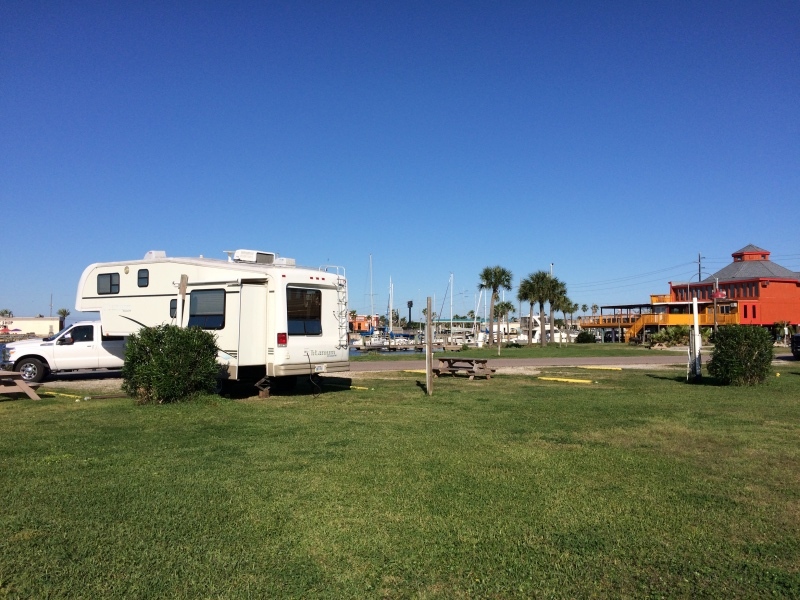 [Monday, April 4] After breakfast at home and a short stop at Kroger for last minute items, we went down TX-6 to Galveston, where we checked into Bayou Shores RV Resort, site D11. We spent the afternoon in the trailer, relaxing and reading. After dinner that night, we drove to the seawall and walked about 3 miles along the wall, to get in our exercise for the day. < Our campsite, D11. < View of boats from our campsite. < Galveston Pleasure Pier during our walk along the sea wall. 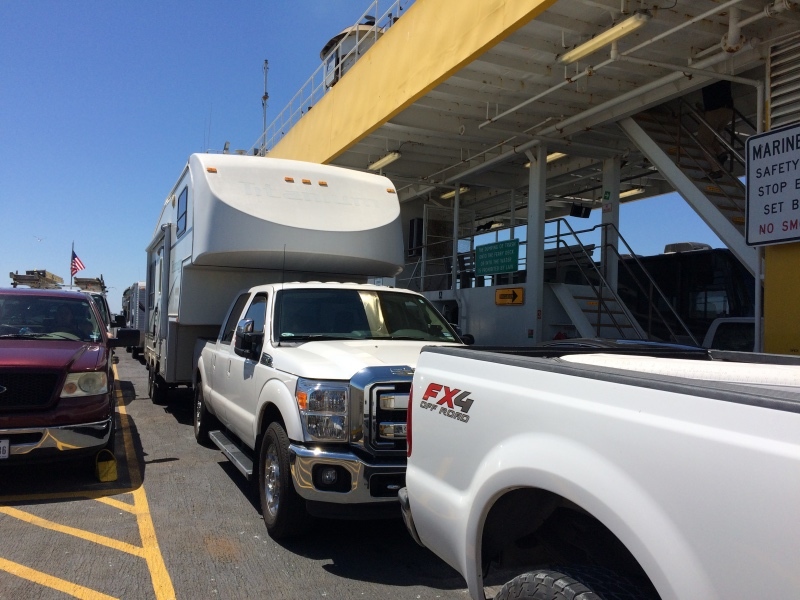 [Tuesday] After breakfast, we drove to the Bolivar Ferry dock and took the ferry to the Bolivar Peninsula. 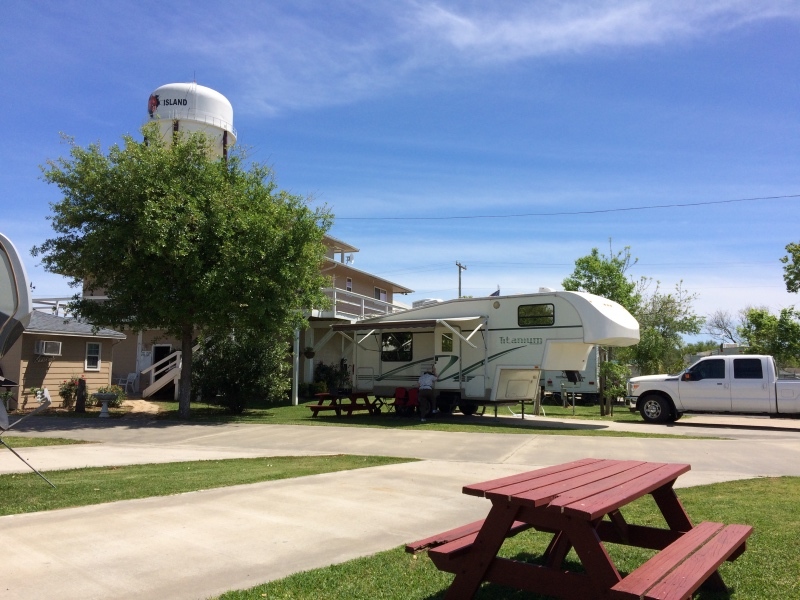 We then drove TX-87 to High Island, where we checked into High Island RV Park, site #16. < Riding the Bolivar Ferry. < Our campsite #16 at High Island. After lunch, we walked over to the Boy Scouts Woods Sanctuary to see what was going on. 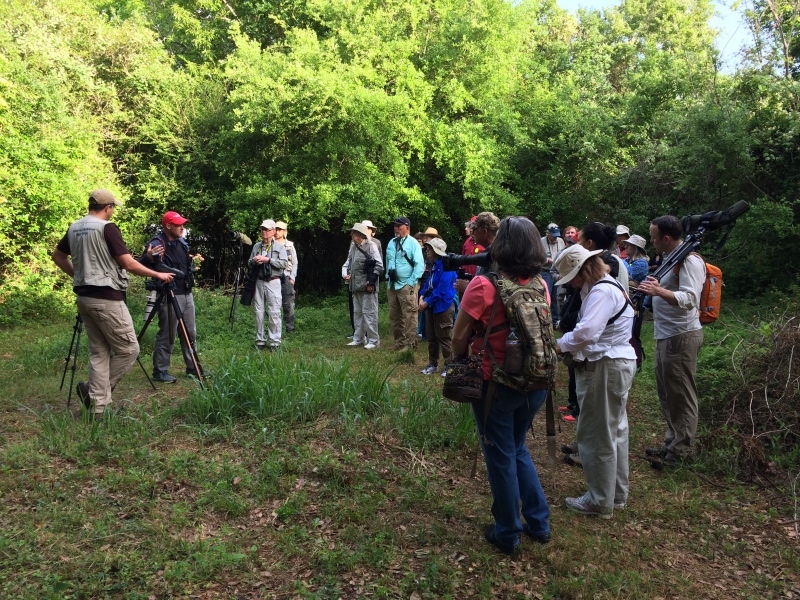 We paid for a Houston Audubon Society pass for 2016 and found that the birding walks would start on Thursday morning. Afterwards our friends Pat & Annette arrived in their RV and we visited and ate dinner at our trailer and talked into the night at their RV. [Wednesday] After breakfast, we walked over the Boy Scouts Woods with our friends and found that since the winds were from the south today, the birds keep flying and don't drop in the High Island woods. So we were disappointed and didn't see anything new. 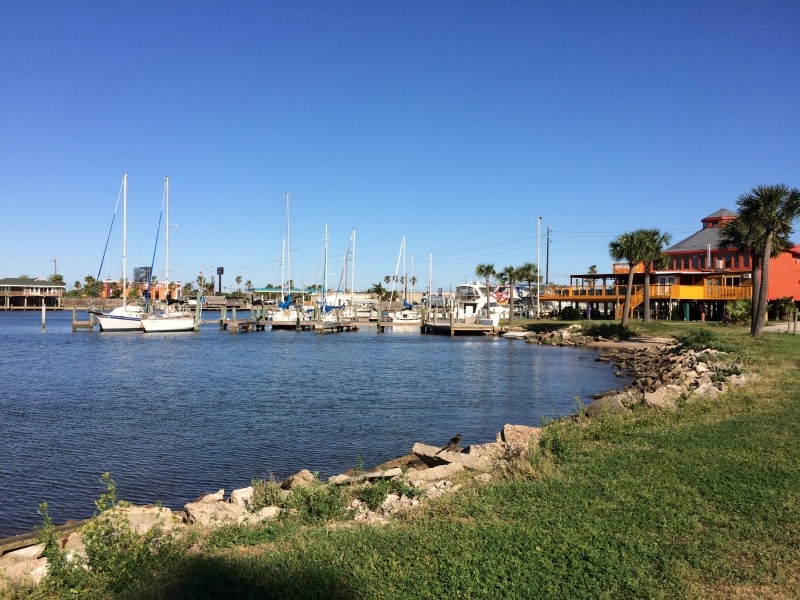 At lunch, we drove down to Crystal Beach to Stingaree Restaurant and ate a seafood lunch. 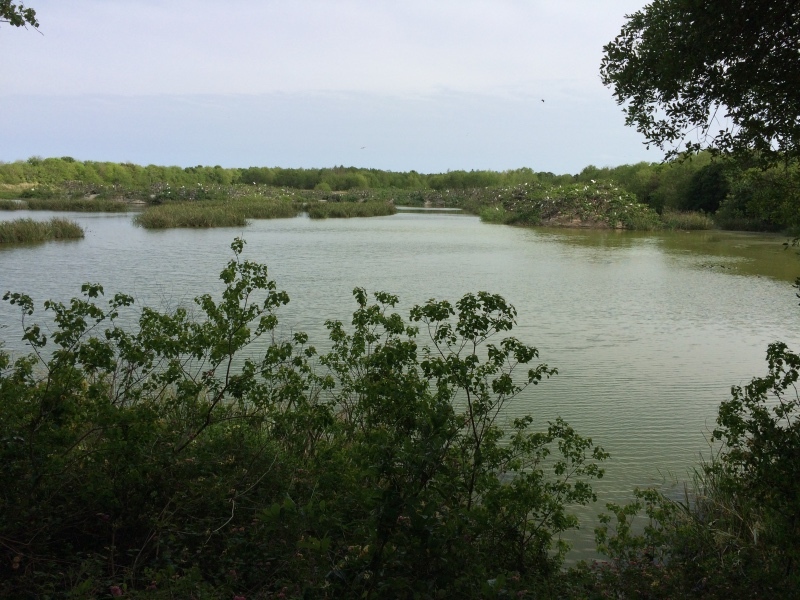 In the mid-afternoon, we went to Smith Oaks Sanctuary and the rookery, where thousands of waterbirds nest on a small island in the middle of a small lake. It is always an amazing site this time of the year. 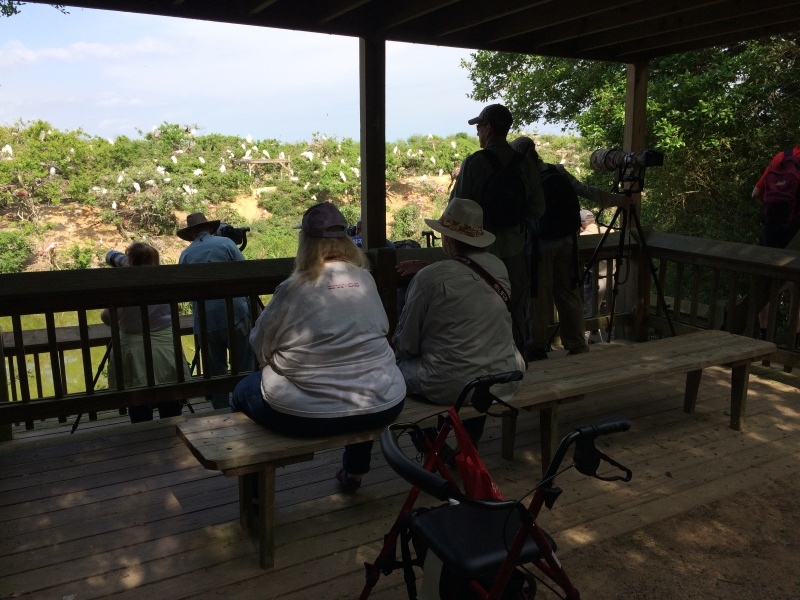 We saw Roseate Spoonbills, Great Egrets, Snowy Egrets, Cattle Egrets, White Ibis, Neotropic Cormorants and Anhingas in great quantities, as well as a few small songbirds, including the Prothonotary Warbler and Indigo Bunting. < < < < The Rookery at Smith Oaks Sanctuary. [Thursday] Our friends had to go back home this morning. We walked over to Boy Scouts Woods for the 8:30 AM bird walk, conducted by professional birding guides from Tropical Birding. We walked around BSW for about 1 1/4 hours. Among the birds we saw were the Summer Tanager, Black & White Warbler, Savannah Sparrow, Swamp Sparrow, Loggerhead Shrike, White Eyed Verio, Blue Gray Knat Catcher, Swanson Thrush, Brown-headed Cowbird, Indigo Bunting, Gray Catbird, Woodthrush and Louisiana Water Thrush. < Tropical Birding bird walk. 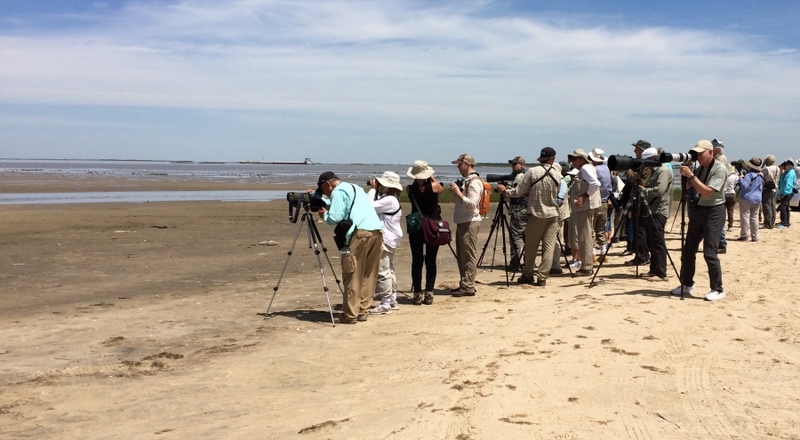 At noon, we met the birding guides again and we all drove in a convoy to Rollover Pass to look for waterbirds. 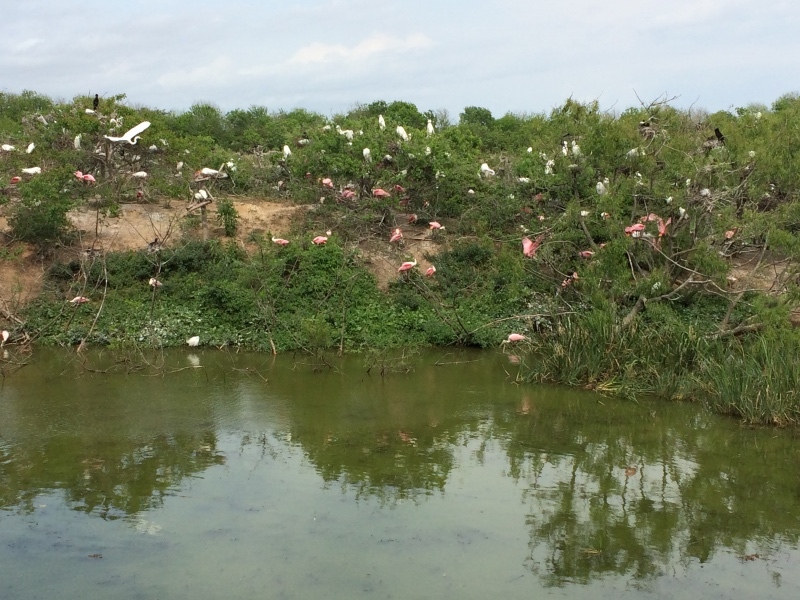 We saw thousands of waterbirds along the shore of the Intercoastal Canal. If not for our knowledgable birding guides, we would not have been able to identify most, but with their help, we saw probably 30 different species. 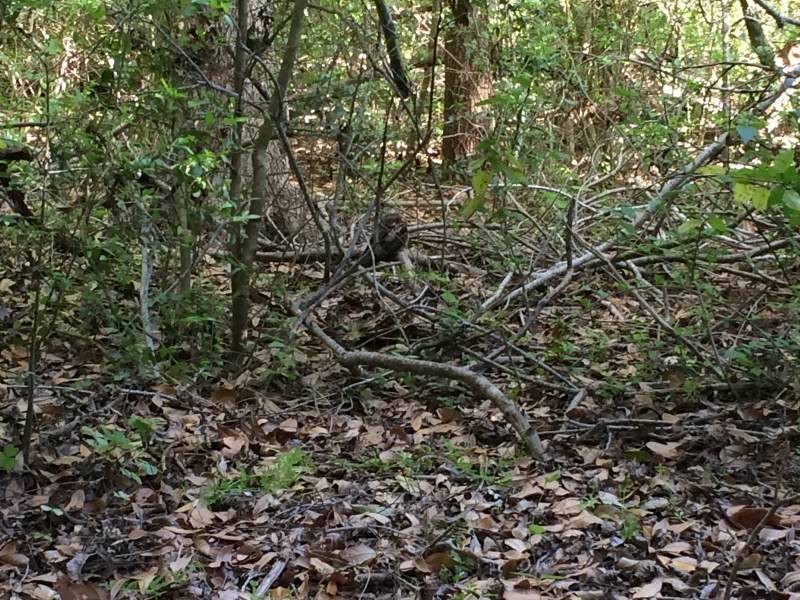 At 4:00 PM, we met our guides again at Smith Oaks and walked in the woods and then went to the rookery. We were able to see a Blue Grosbeak up close, as well as all the waterbirds in the rookery. After the Smith Oaks walk was over, we got word that a Chuck-Wills-Widow had been spotted at Boy Scouts. We went back over there with our guides to see what all the excitement was about. We were able to get so close that I was able to get a decent photo on my iPhone. < Chuck-Wills-Widow sitting on the ground. [Friday] After breakfast, we departed from High Island via TX-124 and I-10 to Richmond. This draws to a close our very short trip to High Island. We hope you enjoyed the photos and brief descriptions of our activities. God willing, join us again soon for another travel adventure.